The biggest obstacle to a more balanced market between buyers and sellers is a lack of homes for sale. Many areas across the country where job and population growth have been strong need more new construction. 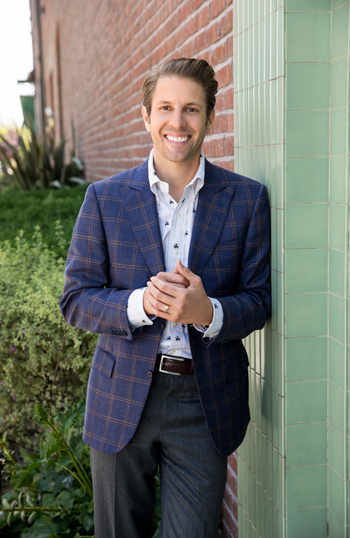 In California, unique regulations make the building environment particularly difficult, while tax laws may discourage current homeowners from selling unless necessary. Demand for housing is high in urban centers where building new stock is expensive and cumbersome. This will continue to drive up rents and home prices. Affordability will remain an issue unless builders construct more homes in desirable locations. The mortgage-credit box is expanding, but it still has a way to go. Homeownership rates are not falling because of lack of interest in homeownership but because of changing demographics. The housing market must be inclusive for all Americans and Californians. New demand in coming years will stem from the 3.7 million formerly foreclosed buyers who will start returning to the market, minority buyers, and millennials who are marrying later than previous generations and hence delaying home purchases. Everyone on the panel agreed that the lack of new construction is a major supply problem facing many desirable and economically vibrant U.S. cities, with California experiencing one of the most severe shortages. The lack of housing is in part driven by people’s desire to live closer to central cities where land is more scarce and expensive to build on. These conditions have driven home prices and rents rapidly beyond the pace of income growth, critically compromising affordability. Further, Mayer pointed out that technology has made it more attractive to live in urban areas. In other words, the benefits of technologies such as Uber, Yelp, and Airbnb are associated with density and urban living, and it has made demand for city living higher than it might otherwise be. Green noted that people with college degrees live in different locations within a metropolitan area than people without a higher education, and the location is often determined by their incomes and consequent affordability. People without college degrees are living farther from downtown areas than ever before because their incomes are depressed and they can only afford to live in those areas. One important fact to keep in mind is that two-thirds of the U.S. population does not hold a college degree, so their income-growth potential is very limited. California’s regulatory environment poses many obstacles to new construction, causing land prices, labor costs, and home prices to appreciate well above the national average. I will discuss this issue in more detail in a future column. While not everyone agreed on this topic, more panelists erred on the side of insufficient mortgage-credit availability. Mayer thinks that mortgage credit is still insufficient and highlighted that we actually do not have a good understanding of what the appropriate credit box should be. Underwriters collect only as much information as they need to approve a loan. However, if a buyer has a second job and that information is not entered into the loan documentation because it is not needed for underwriting, we do not know about that extra income. In other words, if a buyer makes a 3 percent down payment, we don’t know if he or she could have made a 10 percent down payment. Credit scores are the only data that don’t suffer from this bias and can give us a better sense of the mortgage availability. And according to FICO score data, the share of recent mortgage borrowers has been markedly shifting to higher scores, while borrowers with lower scores represent a considerably smaller share of buyers. Homeownership peaked in 2004 and has been declining since. The appreciable portion of the run-up in homeownership rates came from two factors: continually declining interest rates at the time and demographic changes. A large share of the population was entering into peak homeowning years — ages 40 to 60. Following the peak in 2004, homeownership rates were held up with incremental buyers who were primarily entering the market as speculators. The following sharp decline comes over a period of time when the population continues to age, which works strongly against homeownership rates. 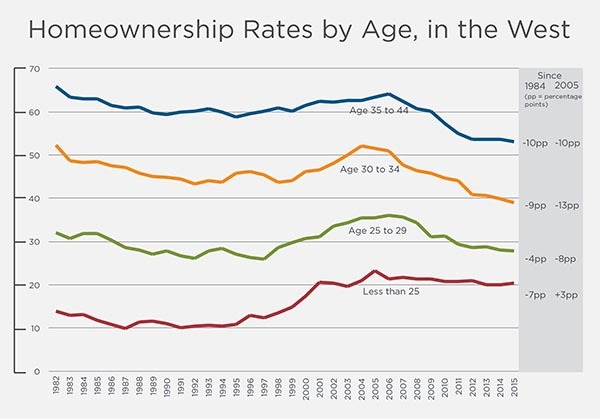 At the same time, homeownership rates for younger households are at an all-time low (see Figure 1). Among the households aged 35-44, homeownership rates today are 10 percentage points lower than both in 1984 and 2005. Households between age 25 and 34 have seen more dramatic drops when compared to 1984, while only those age less than 25 have actually seen an improvement. Green offered a compelling explanation of declining homeownership trends among young people tied to marriage rates. As he said, married people typically own homes while single people rent. Since single people do not appreciate the fixed costs of owning a home, they may want the flexibility of moving if they meet a prospective spouse. There has been a decline in marriage over generations, and across the world (see Figure 2). 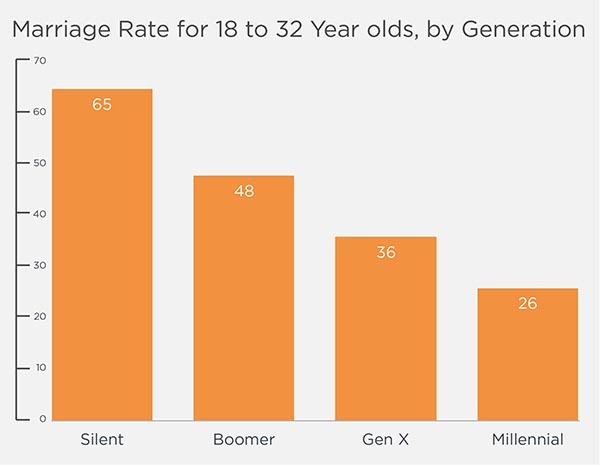 Only one in four of today’s millennials is likely to be married by the age of 32. Among the Silent Generation — those born between mid -1920s to the early 1940s — almost seven in 10 were likely to be married by the age of 32. That’s a remarkable difference. One important factor that has led to varying marriage rates is the difference in educational levels of women today and women of the Silent Generation. Today, young women are 8 percentage points more likely to have a college degree than males of the same age. Back then, males were 8 percentage points more likely to have a college degree. Also, according to recent research, well-educated men are more willing to marry less-educated women than well-educated women are to wed less-educated men. This creates a great marraige mismatch. Another point is the residual impact of the foreclosure crisis. After the market collapsed, 5 percent of American homeowners ceased to be so, and most of them retreated to the rental market. There are about 3.7 million of these folks, and they will eventually start thinking about homeownership again. It’s too soon, however, to say when they will arrive. Lastly, there is another demographic shift that will have a profound impact on the housing market in the future. The number of minority households is increasing at seven times the rate of non-Hispanic white households. However, their homeownership rates are much lower. According to Green’s analysis, the homeownership gap between non-Hispanic whites and the African-American population is 17 percent even after accounting for a number of factors, including education levels and income. One important explanation for the gap is a lack of intergenerational wealth that most minority households do not benefit from. This will considerably constrain their ability to compete in the housing market. However, if we want the increasingly larger number of minority households to participate in the housing market, we need to seriously think about overcoming the issues such as lack of intergenerational wealth and wealth in general. Although we are in the fourth year of the housing recovery, there are concerns over the sustainability of rapid home price appreciation and lack of inventory. From the discussion above, it can be surmised that there are pressures on both the supply and demand sides. Unequivocally, desirable urban areas — especially those in California — desperately need more housing, partially due to historically insufficient construction and partially due to their attractiveness. Still, having more housing will not answer the question surrounding falling homeownership rates, though that is not something of great concern just yet. Homeownership is still the most desirable outcome for many households. Demographic changes and residual effects of the Great Recession have been suppressing homeownership rates and may continue doing so for some time. On the other hand, there is a huge portion of the population coming into the age when they will start forming their own households and seeking homeownership. It is critical to ensure that there is sufficient housing affordable to this generation to allow them to achieve this goal. Selma Hepp is Pacific Union’s vice president of business intelligence and chief economist. Her previous positions include Chief Economist at Trulia, senior economist for the California Association of Realtors and economist, and manager of public policy and homeownership at the National Association of Realtors. She holds a Master of Arts in Economics from the State University of New York (SUNY), Buffalo and a Ph.D. in Urban and Regional Planning and Design from the University of Maryland.